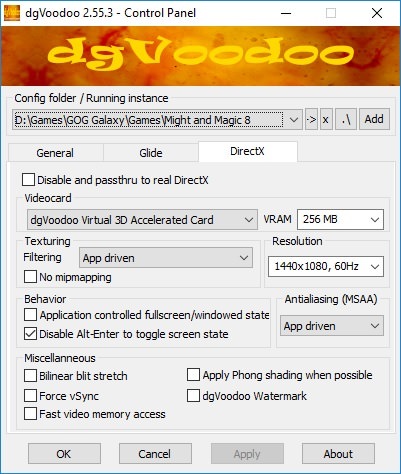 Installing dgVoodoo on my 2.1 patch only slows the game down, unless you disable native HD mode of my patch. 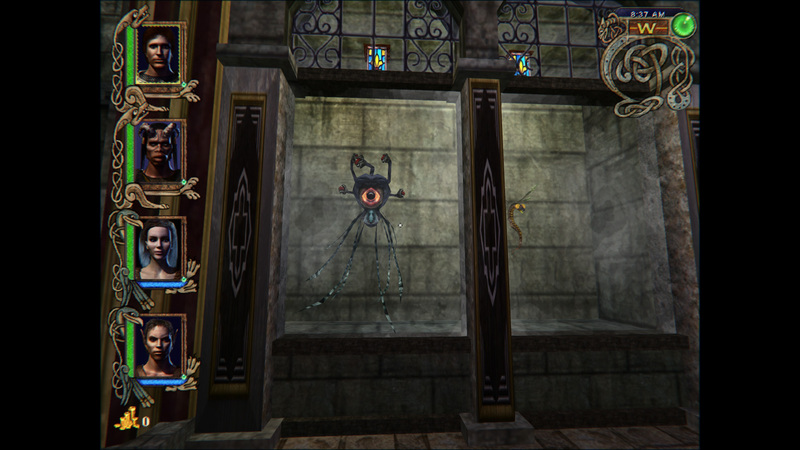 Of course black bars are there, it's a 640*480 game, it would be stretched otherwise. Last edited by GrayFace on Aug 18 2018, 2:23, edited 1 time in total. Sorry only saw your reply now. On tomchen1989's OP on this he has screenshots of this running in 1440x1080 with no black bars in the screenshots? I'm trying to get the same thing. 1440x1080 should be without black bars and 1920x1080 with them. If that's not the case, please attach a screenshot. I'm talking about a screenshot of black bars in my patch on a 4:3 resolution. Or do you want the patch to change resolution for some reason? I'll add non-proportional stretching, as it would indeed be useful for 5:4 monitors, because they're too close to 4:3. Also, if you want to use dgVoodoo, you can add "SupportTrueColor=0" to patch ini. Last edited by GrayFace on Sep 9 2018, 3:54, edited 9 times in total. I've tried running the game in native 720x480 but it still had black bars, albeit smaller. When I ran the game natively in 800x600, the black bars were gone but there was no high defintion quality. Where can I find the patch ini to add "SupportTrueColor=0"? I don't see one tied to your MM8 patch I downloaded. I don't know if I'm doing a particular step wrong, I followed all the steps here - https://www.celestialheavens.com/forum/10/16657, and then followed the steps on the first page of this thread for dgVoodoo2. This used to work for me, but after not playing for a while, I came back to the game (the 6 + 7 + 8 merged version, if it matters) and the game's internal resolution is stuck at the default and doesn't change. 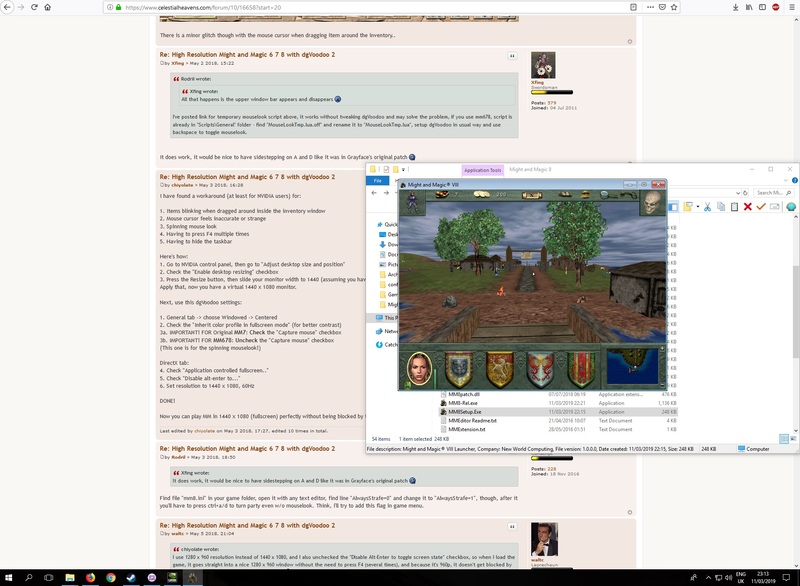 DgVoodoo is clearly having some effect - when I change the resolution, the size of the mouse cursor changes, and the black bars on the sides appear or disappear (depending on what I have it set to). But the actual game looks the same. Is it possible that a Windows update messed things up? Edit: Never mind, it magically started working! I set the resolution to the maximum available one and it actually changed how the game looked, and then I changed it back to one with black bars (and the normal aspect ratio) and it was still good. Baffling, but at least it works now. Last edited by blacktrance on Oct 6 2018, 19:13, edited 1 time in total. 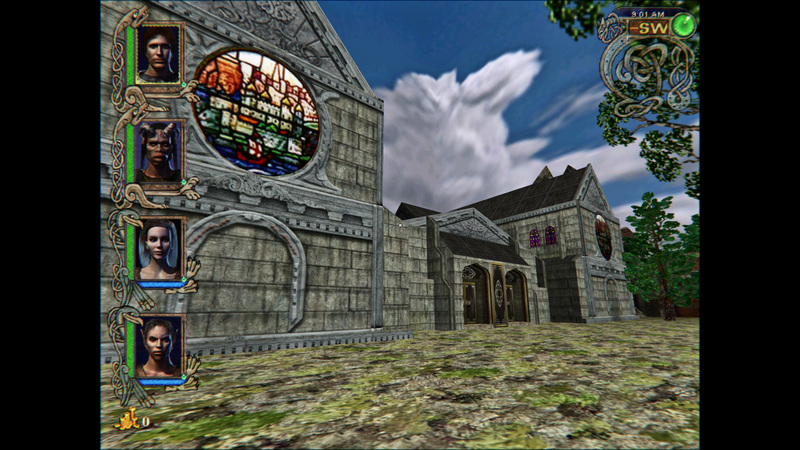 Happy to report it does work with Might and Magic 9 - Writ of Fate (GOG). Last edited by J8tattoo on Feb 19 2019, 4:45, edited 2 times in total. 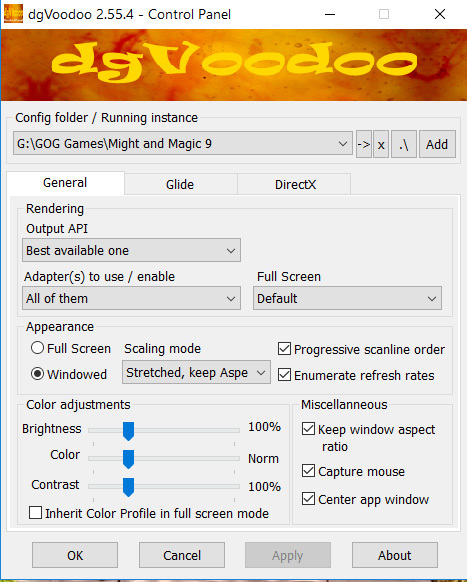 How are you getting MM9 to run with dgVoodoo2? I added the directory, then ran mm9.exe and dgVoodoo2 does not appear in the video / display driver options in game. I am using the original version. Last edited by EstelRandir on Mar 1 2019, 4:52, edited 1 time in total. Coming back to this as I originally gave up but gave the instructions another go again and don't really mind at this stage about the black bars. However after trying all the instructions when I run the game (MM678 merge btw) in full screen the game seems very low resolution, laggy and the music skips a lot. If I press F4 to go windowed it looks great, no lag, no music skipping etc.... but the window is extremely small. 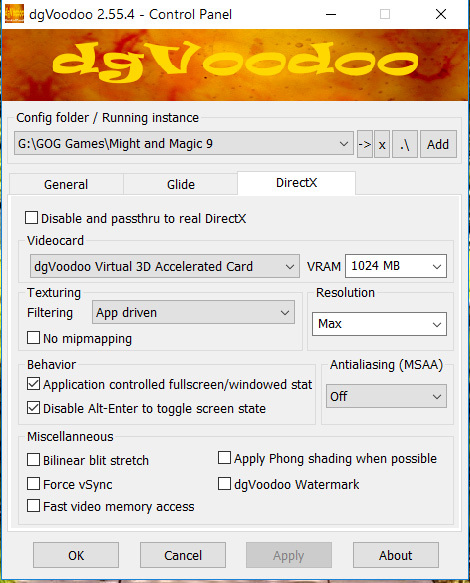 EstelRandir wrote: How are you getting MM9 to run with dgVoodoo2? I added the directory, then ran mm9.exe and dgVoodoo2 does not appear in the video / display driver options in game. I am using the original version. Cravez wrote: Coming back to this as I originally gave up but gave the instructions another go again and don't really mind at this stage about the black bars. However after trying all the instructions when I run the game (MM678 merge btw) in full screen the game seems very low resolution, laggy and the music skips a lot. If I press F4 to go windowed it looks great, no lag, no music skipping etc.... but the window is extremely small. Anyone able to help with this one? I want to say GrayFace's 2.2 patch did something with the graphics that is similar to what DGVoodoo would have done, making this no longer necessary to improve one's graphics. Not 100% sure about that though, you'd have to ask him and clarify. This screenshot was before I installed the Grayface 2.2 patch but I think you might be onto something with the MM6.ini file, thing is I don't have that file. I followed instructions on the MM6/7/8 merge and I installed GOG version of MM8 so I only have the MM8.ini file?